Support/Resistance is widely used by Technical Analysts as a way to enter and exit trades and set targets. Support/Resistance levels automatically drawn on visiting any chart using Artificial Intelligence. 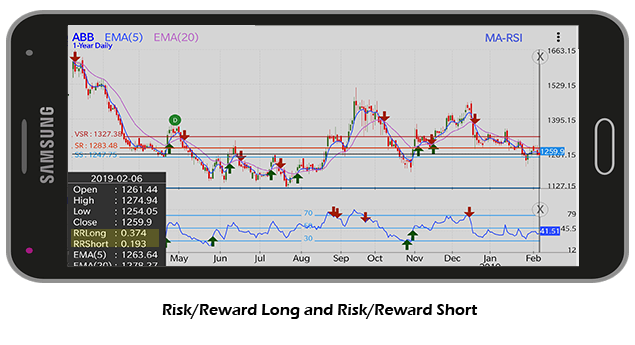 Auto-SR -based scans to help identify support/resistance breakouts. 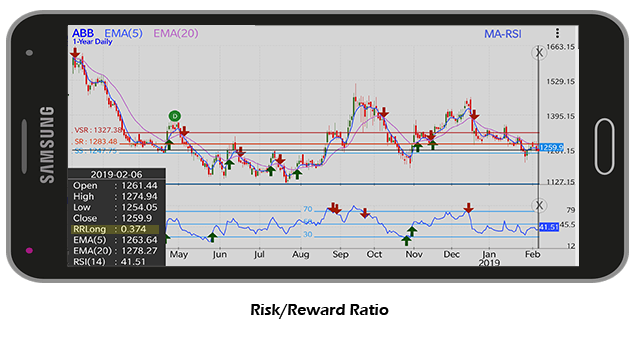 Step 1: Simply select Auto S/R Levels from the chart menu “RST” and get the Auto S/R Level or any Auto S/R features instantly. Auto S/R based scans to help you identify breakouts and breakdowns. There are 4 default levels: VSS, VSR, SS, SR.
VSS line shows Very Strong Support, in same way VSR shows Very Strong Resistance and SS and SR indicates Strong Support and Strong Resistance respectively. As you can see that in above screenshot, we have captured all the 4 lines very clearly with different colour to make it clearer. Supply-Demand Zones (or Support-Resistance Zones or SR Zones for short) are areas of supply/demand created in the chart. 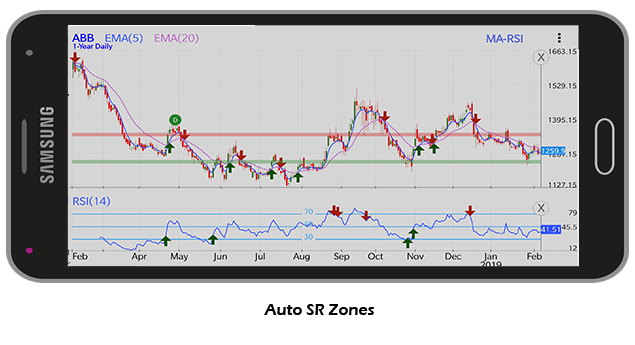 Nearby Support/Resistance lines can be clubbed together to create a Support/Resistance zone. Using S/R zones instead of S/R lines can improve the accuracy of trading immensely as it can help you to avoid false buy/sell signals as well as give better targets and stop losses. Red line indicates Resistance zones and Green line indicates Support zones. 1. 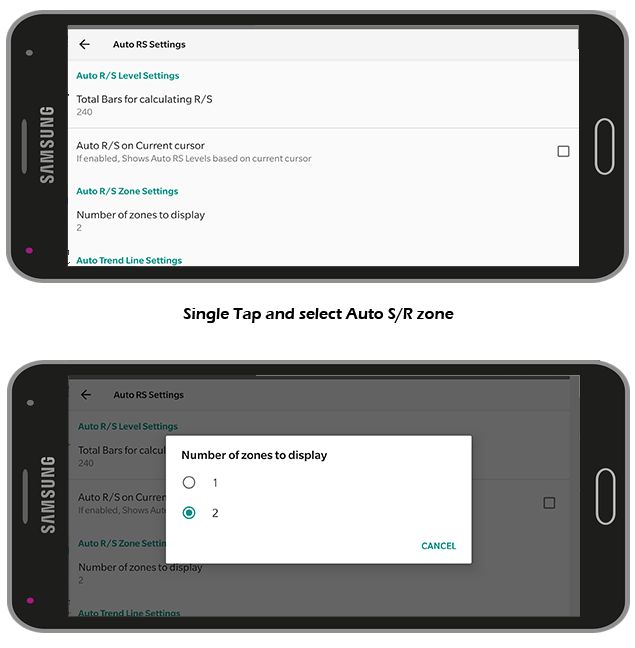 Select the Setting option from menu and then select Auto S/R Zone Settings. The auto-trend line feature determines the current uptrend and downtrend line and draws them. The Risk to Reward ratio is another metric that is key to successful trading. 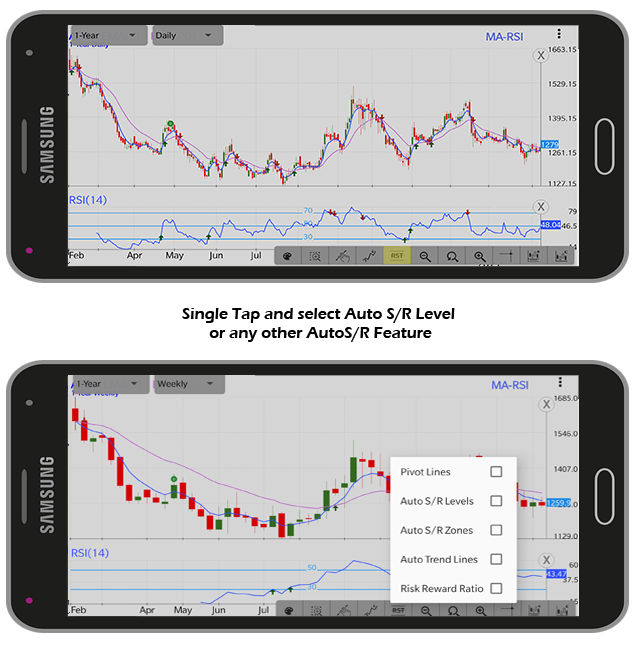 Investar App has the capability of not only drawing the support/resistance automatically using Artificial Intelligence, but also to calculate the Risk/Reward ratio based on that. Simply check the Risk/Reward Ratio from the “RST” chart menu. 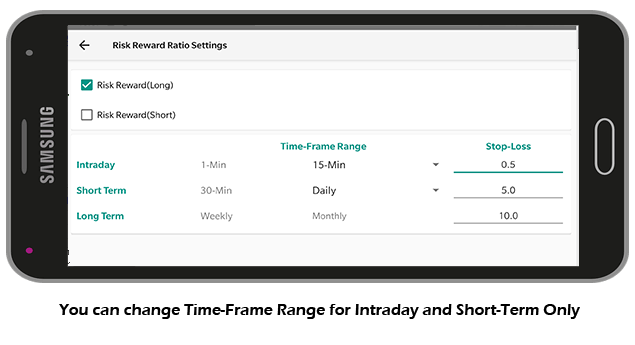 Select the Setting option from menu and then select “Risk/Reward Ratio Settings”. To configure the Risk/Reward ratio, you need to set the stop-losses based on the type of trading you do. You can easily Enable/Disable Risk Reward (Short) option. By default we only show Risk Reward (Long), but you can change it. Note: You can also reset all the Auto RS setting to default setting and clear cache to remove all the Auto RS related cached data. What are the new Changes in Beta? This entry was posted in Investar and tagged Beta Released, Investar Mobile Beta, Mobile. Bookmark the permalink.